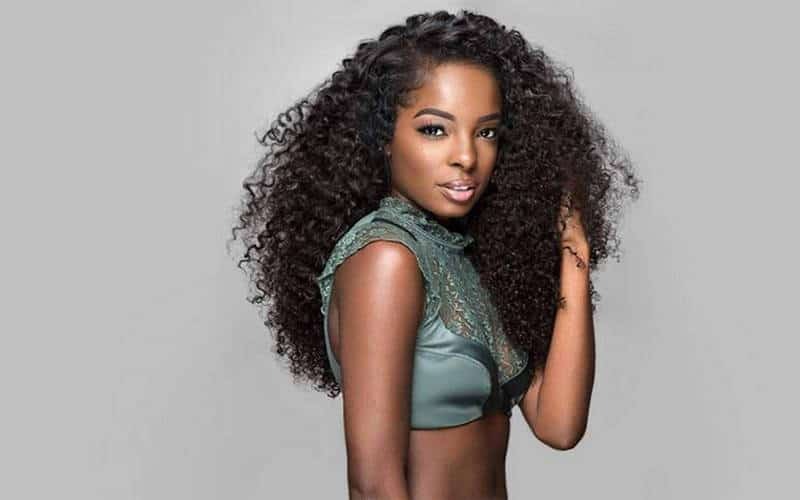 What Are The Difference Between 100% Natural Human Hair And Remy Hair? Home	→ Blog → HAIR EXTENSIONS → What Are The Difference Between 100% Natural Human Hair And Remy Hair? Welcome, today we will talk about the extended wigs are an indispensable part of each female to enhance their charm and confidence. The hair is the corner of the human right, so please take care of your own beauty. And more importantly, we will talk about Human hair Extensions. 2 So what’s the difference between 100% human hair and my hair? 3.1 Can Remy human hair be bleached? 3.2 What is Remy human hair color chart? When talking about a pure hair extension, consider where it comes from. Most of the wigs come from India, where they ensure the ingredients make the most elaborate hairstyle. And we can be assured that they contain very little of the chemicals. Engineering is the problem. It should be noted that even the highest quality hairs that are sourced through the most reliable methods may not be Remy hairs. The thing to keep in mind is that there is a natural direction to it – the root and the bottom, or the top and the bottom. And the outer shell always points downward. Remy hair has this direction to the account, which means the hair is right with the root side at the top. The bottom edge at the bottom, and the epidermis facing downwards. Besides, Non-Remy hair is mixed, with some hair oriented in the right direction, and some hair in the wrong orientation. This is why hair is not easy to get serious and damaged – when you brush it. You are brushing your teeth on the outer feather of the lower feather, making it more prone to breakage or tangle. What determines the type of hair you get is technical. When collecting donated hair, the monks may shave their heads or tie and cut the hair so that the fibers stay together. Shaved hair ends scattered on the floor to be collected later, ends. And cut hairs together in the correct alignment. Remy’s hair comes from the second method. So what’s the difference between 100% human hair and my hair? Many of you confused between the two but it is very different. First REMY has features like the direction of the underlying shell, basically means that the hair follicles all go in one direction. Remy’s hair is collected in a method in which all the hairs keep straight in the natural direction when it’s large (ie keep the hair in a ponytail and cut). And on top or ends at the top. Maintaining the natural texture model and the epidermis. This eliminates the confusing problems of uncommon quality or low quality. Remy hair is only handled lightly. Maintaining the natural texture model and the epidermis. REMY Artificial hair lasts up to 3 to 6 months with regular maintenance. Often 100% this hair taken from the hairbrush and hair has fallen to the floor. It is in greater supply and therefore is much cheaper than Remy hair. Much of the human hair extension that sold today is Remy’s hair. Because of the method of collection, the epidermis for each hair tends to be in all different directions. To compensate for this, the hair will go through a process sometimes called “acid bath”, to completely remove the entire epidermis. This can be equivalent to about 10 sets of relaxation in succession. After the removal of the epidermis, the hair is immersed in silicone to make it shine and to hide any epidermis that is not removed in the acid bath. Silicone adds weight to hair and increases the price when the hair is sold by weight. At first glance, the non-remy hair becomes smooth and shiny. After some shampoos, the silicone layer will begin to wash. Hair will gradually become fuzzy, brittle and will tangle and blur very easily. Can Remy human hair be bleached? Yes, technically you can dye and bleach your Remy human hair hairpieces. What we mean by technically? 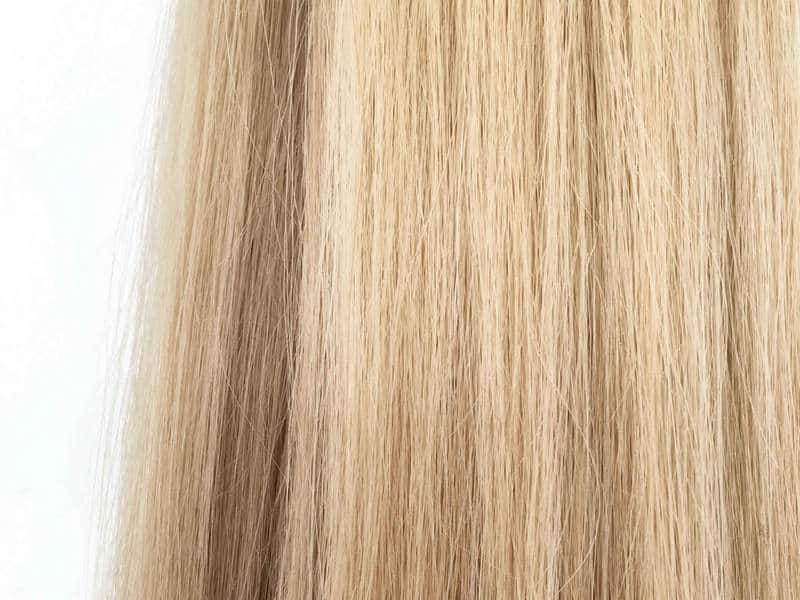 Remy human hair is compatible with coloring or bleaching products. If you want to bleach black hair, the color turns white or light yellow anyway. Remy human hair isn’t much different from your natural hair in term of styling. However, we would not recommend you to bleach nor dye your Remy human hair. Since this hair type is separated from the head, it no longer receives healthy sebum to lubricate hair strands and support the outer cuticle layers. We would not recommend you to bleach nor dye your Remy human hair. If you bleach or dye Remy human hair natural black too often, for example, then the cuticles are likely to be tripped away, leaving the hair frizzy, dry and matt. It is also harder to bleach Remy human hair natural black compared to other hair types. Typically, a hairdresser needs to lighten at least three times to perfect the color. This is extremely harmful to your set of hairpieces. 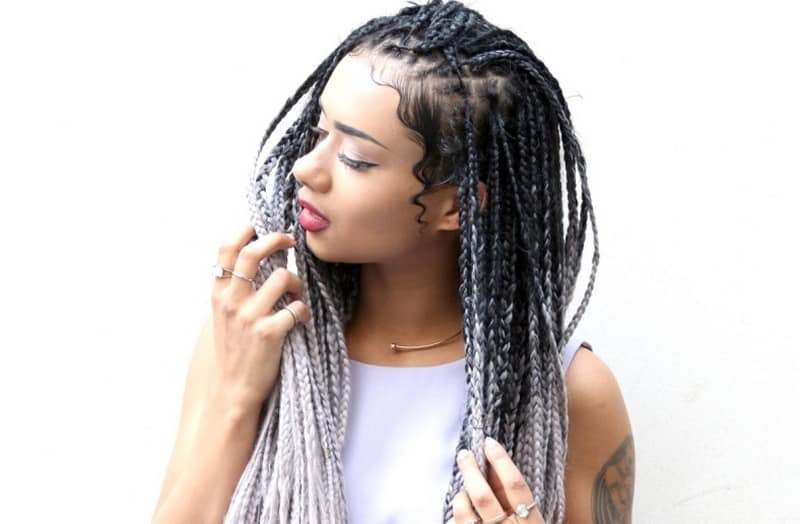 If you still want to bleach or dye your hairpieces from time to time, we would suggest you choose virgin human hair. This hair type can stand different hair processing without being deteriorated too soon. What is Remy human hair color chart? Remy human hair color chart is an indispensable part of any hair salons, hair extensions traders and vendors. As for individual buyers, this hair color chart is also necessary too. 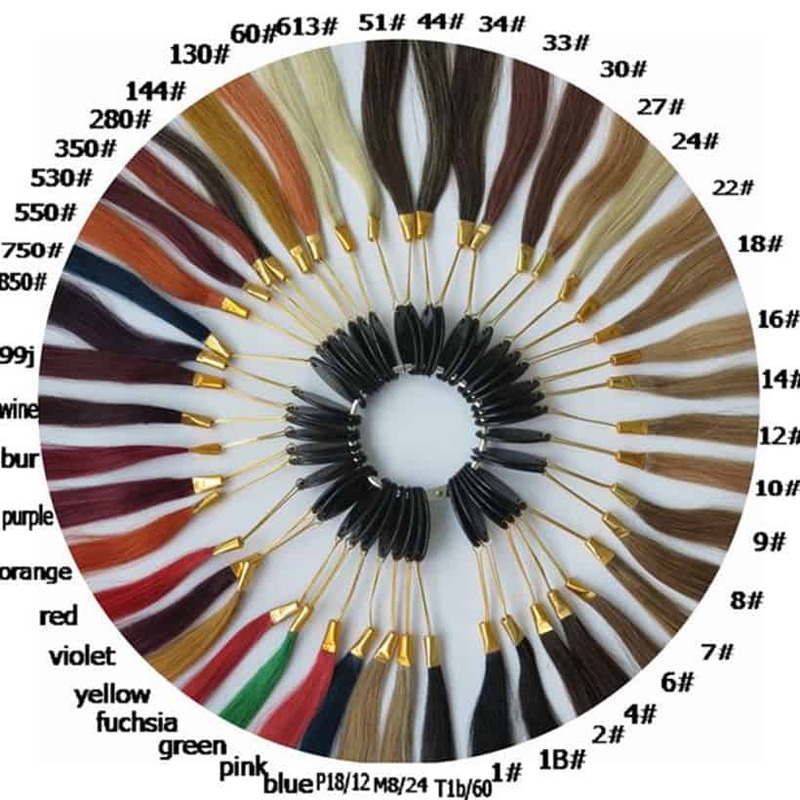 The Remy human hair color chart allows buyers to have a vivid idea of what the color will be like on Remy human hair strands. Based on this information, customers can make an insightful decision on which color they want. This also prevents any misunderstanding between wholesale hair vendors with their customers regarding hair color. Before placing an order, make sure that you double check the Remy human hair color chart of the vendor. Don’t trust random pictures on the Internet because the color could have been altered, so it looks brighter and more attractive. Remy human hair clip ins or Remy human hair clip-in extensions are ladies’ forever favorite items. They are instant solutions for hair thinning problems, hair loss, and other hair issues that require long-term medical treatment. These items also increase users’ hair density in the twinkling of an eye. If you want to enhance your look for tonight’s party without much hassle, clip-in extensions are the absolute choice. Remy human hair clip ins or Remy human hair clip-in extensions are ladies’ forever favorite items. The construction of clip in hair extensions allows users to clip in and clip out the hairpiece easily. It takes less than 5 minutes to wear it on and take it off. How about the cons? There are certain hairstyles that clip-in lovers need to stay away from, such as ponytail and updo styles. If Ariana Grande’s ponytail inspires you Remy human hair clip in a ponytail is what you should buy. The voluminous ponytail isn’t natural. Ariana Grande needs to wear quite a few hair clip-ins in order to create heir hair symbolic. If Ariana Grande’s ponytail inspires you Remy human hair clip in a ponytail is what you should buy. But you just said clip-in hair extensions aren’t for a ponytail? Yes, we do! But it is only true in case you want to enhance the density of your hair. That means wearing hair clip-ins under layers of your natural hair. 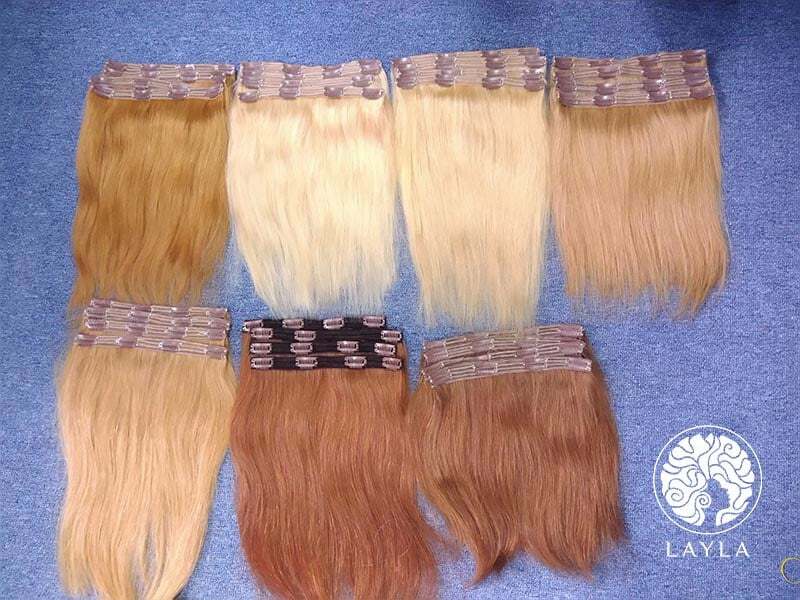 For those who want to create ponytail using clip-in extensions, you need to buy a special kind of clip ins. 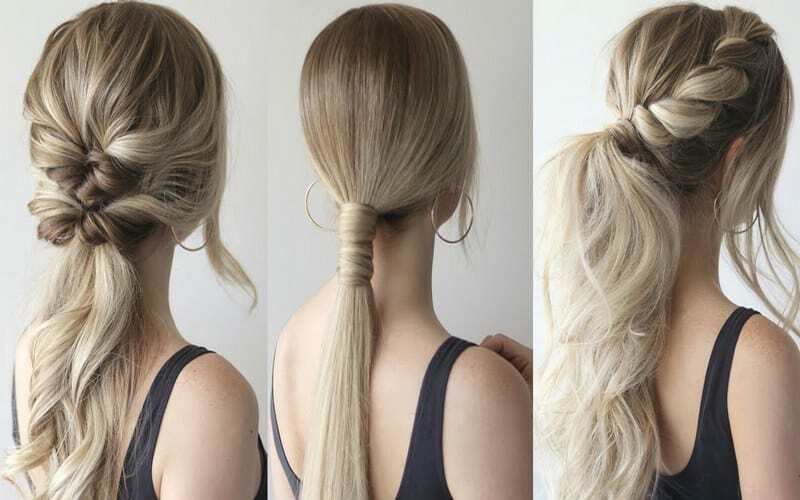 This Remy human hair clip in ponytail includes extra hair so that you can wrap it around the tail to create the lovely ponytail like Ariana Grande. Are you a big fan of bangs? For ladies who have a massive forehead, Remy human hair clip in bangs are the answer for your prayer. You will totally enjoy the unique construction of clip in bangs. The tiny clips at the end of the patch can stay firmly under a thin layer of your hair. For ladies who have a massive forehead, Remy human hair clip in bangs are the answer for your prayer. The great news is a clip in bangs aren’t expensive at all. They are indeed a suitable hair accessory for those who want to change their hairstyle from time to time. It is important for you to choose the best hairstyle for choosing the best quality hair. Because there are many people who try to make money in the hair industry. And because they know how to sell their hair for money. They will sell extensions, wigs, and large numbers of hair mixed with hairs other than human hairs to compensate for the low price. However, not everyone can sell out $ 200 for each hair package. The virginal human hair is the virgin that never processed. It comes straight from the donor’s head without any change. So, if you see someone saying that the virgin hair has a color code for it or if the curls or natural waves for that hair are not virgins. However, it is still human hair. Human hair should not feel rough although it is treated or stained. If it’s likely it has mixed with the hair type, though minimal. And, if a person claims 100% of human hair, ask for proof before making a purchase. You know, if they have no proof, they should not list it as 100%. Here are a few suggestions we would like you to be able to equip yourself with the knowledge you need to have a 100% human hair extension. Believe and always follow Layla Hair to get the necessary information.